Counting all the things that Tony Hawk has marketed since the '80s is like making a list of all the stuff that that kid bought in Blank Check: cars, video games, skateboards, clothes, Six Flags rides. And that’s not even counting his work in his global charity or the Christian Slater movie where he uses his skateboard skills to defeat a gang of murderous weapons smugglers (which is a real thing by the way). It all started in the early 1980s, when Hawk’s manager, Stacy Peralta, began filming the Bones Brigade team videos. Tony Hawk was 15 years old and more stork than boy, but he rode skate parks with an otherworldly precision that almost justified the movie’s goofy reaction shots of old people shaking their head in disbelief. After a string of videos and consecutive skateboarding titles, Hawk was a rock star. Look at any major contest from the late ‘80s and it’s virtually indistinguishable from a sold-out concert. The chanting crowds, the flashing lights, the neon clothes, it’s all there. Between Tony Hawk and his top rival, the preternaturally smooth Christian Hosoi, they’d drawn endorsements from Mountain Dew, Swatch, Converse and Jimmy’Z. Brands were falling over themselves to cash in on this untapped market of rebels, which of course led to beautiful ads like this and this. How popular were these guys? Enough so that they could launch brands they had nothing to do with. The Airwalk shoe, for example, was born when Bill Mann’s son begged him to make a skateboard shoe after watching Tony Hawk pull off his signature move where he pulls the board away from his body in mid-air and makes a walking motion with his feet. And then in 1999 there was Activision’s Tony Hawk Pro Skater. 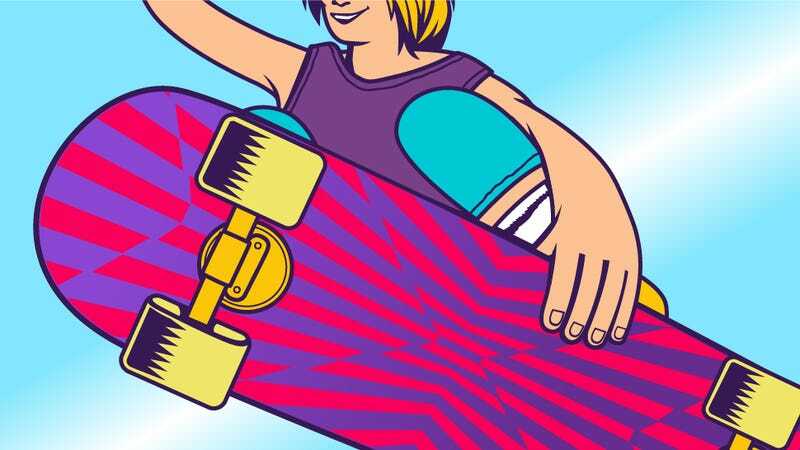 Finally, gamers could find out what all that "Kickflip," "Madonna," and "Smith Grind" business was about, and do it with real pros like the ghetto blastin’ Chad Muska, big-air specialist Bucky Lasek, and, of course, Tony Hawk. In perhaps the greatest publicity move of all time, Hawk also landed the first "900" – 2 1/2 aerial rotations – on ESPN’s X Games just weeks before the game’s release. More than a dozen sequels have followed, bringing new blood into the skateboarding culture (and into the market for Tony Hawk Clothing®). The skateboarding world is both bigger and smaller than it used to be. Pros still market themselves through the same type of videos pioneered by the Bones Brigade in the ‘80s, but now everyone does it and it’s gotten harder and harder for riders and smaller brands to make a name for themselves. The actual number of skateboarders has plateaued or maybe even slipped, even as their style continues to spread. Giants like Nike and Adidas now market their own lines of skateboard shoes and clothes, and you’ll also see rappers rocking Supra shoes and pop stars wearing DGK hats. Both brands were started by pro skateboarders, Chad Muska and Stevie Williams, and both are alums of the THPS franchise. It almost always goes back to Tony Hawk. That guy is everywhere. Watch Tony ollie all over the place and see how the ‘80s changed our culture this Sunday, April 14 at 8 PM on the National Geographic Channel. It’s the first of six episodes of their new three-night event The ‘80s: The Decade that Made Us.